Hi, I've started speedrunning LBA1 lately. I found a few new strategies to improve on the existing runs (e.g. https://www.youtube.com/playlist?lis...3C1FD8109E05A1). I'm unsure on an aspect of the rules and am wondering if anyone here has an opinion. Basically I noticed that different language packs can have very different lengths of voice dialogue. The French language in particular seems to make some key unskippable dialogue shorter. And in fact I tried selecting "none" for language pack and this results in any speech being skippable immediately after the text finishes appearing. This would be akin to the floppy disk version. Clearly this saves a lot of time from the whole run but I'm not certain about the interpretation of the SDA rules here. To set the language you have to use the separate installer program that comes with the game, it's not a truly in-game option. SDA rules say any in-game settings are fine, and I'm just wondering if the installer program could still be considered "in-game" ... since it was very common practice back then to have some configuration in a separate program whereas if the game were made now probably all the options would be in game menus. Sorry I don't have any knowledge of those rules, nor any tip to share. I'll be happy to watch your video when it's completed. It's been 2 years since the last thread, speed running LBA seems pretty intense ! Yeah, its's really intense! Well any speedrunning is, but I think "Relentless" truly deserves its name here. Getting even close to the record times is a serious achievement. Tiny slipups cost huge amounts of time and the "interesting" collision detection and control system definitely don't help any. I'm starting to wonder whether I could ever get close in a marathon sitting but maybe with a segmented run (in theory at least) I've found enough to get pretty close to the 1 hour mark. How long is that youtube speedrun you linked ? Is it that hard to make it ? You made this interesting to me sir, I should speedrun aswell ! I don't think modifying the language option would count as cheating... Disabling wall hits would surely be. Speed Demos Archive has two runs listed for LBA. The segmented run is the fastest at 1:19:14 but obviously that has the advantage of being able to limit the number of mistakes. It's extremely difficult to get through the entire game in a single sitting without making any horrible mistakes, due to the game's mechanics and the questionable collision detection (e.g. hurting yourself when you clip a bit of scenery you're running past, but there are loads of ways things can mess up). Dying can often be really annoying as you get sent back quite a few screens if you don't have clovers, and/or possibly have to repeat a transport sequence. Anyway, I'd definitely say have a go at a run if you are interested, it's certainly an interesting game to run and pretty intense as there are tricks to learn throughout the game and quite a complex route. Prepare to get very frustrated in a couple of places, in particular the Temple of Bu, and the final section at the building site Let me know if you need any more tips and I will also post a video of the new Bu skip I found. Pretty close! With an extra coin it might be worth buying a mechapenguin when refuelling on Proxima, this might actually be ever so slightly faster than picking the free one up at the rebel camp, with the faster shopkeeper dialogue. Needs testing! - Another improvement in Template of Bu. In the 3rd screen when the boulder appears you don't have to wait for it - if you hug the wall to the south you can just run right past it. For bonus points you can hit the switch with your magic ball rather than running right up to it, and finally where there are three switches and platforms you can use your ball there too but this is really fiddly. - Elf maze in the White Leaf Desert. This is a pretty good one as it can take an age to catch the elf. I found a reliable way to manipulate its movement so it gets stuck on a corner and doesn't go anywhere. So you can catch it really easily and then reload the game to exit the maze. This saves a good minute or so and I know the previous runners really struggled looking for a way to optimise this so pretty pleased with this find Will also post a video of this since it's hard to explain how to do it. - Route change. On the return to the northern hemisphere I'm now doing Brundle Island first. This means you then take the hovercraft to Tippet and only take the dragon (or whatever that thing is!) for the final journey to Fortress Island. The hovercraft seems much faster entering and leaving the screen than the dragon so I think this is a good improvement. Not sure why the original route was chosen by both the other runners, certainly doesn't matter what order these islands are done in. - Teleport factory rail jump. After you smash the four teleporters you can jump from the final teleporter onto the rail, then drop down into the room with the computer, rather than run all the way back round the rail. It's a bit fiddly but I believe saves a few seconds if done well. - And there are a couple of other places where walls can be jumped rather than running round - once near the start of the game before you go in the shop, and once coming back down from the water tower after using the cherry liquid. - Also worth mentioning that the game can be reloaded immediately after you press the use key on the cherry liquid, you don't need to wait for the animation there. I should probably make a list of all places where reloading can be used, as it's taken a lot of trial and error to figure out all the places this works. - Since I saved the mechapenguin by not using it on the groboclones, I found the best place to use it instead is on the two red rabbibunny clones just after the sequence with the rebels and the tank. - One other change I forgot to mention before. Instead of sneaking past the supergro to get to the astronomer (using the rabbibunny lady to distract him) you can actually go up the stairs to the left and run past the green groboclone. This is quite a lot quicker. Well I thought I edited this post to fix my broken math. It seems I still forgot a) the hairdryer and b) the 10 kashes you get from the inventor and also c) how to add up numbers at all. - Turning around during screen transitions. This possibly counts as "input buffering". Basically if you are holding forwards or backwards as well as a sideways arrow when a new screen is fading in, you end up rotated an amount depending on how long you held them down. It's possible to get nearly a 180 degree turn between screens using this. Really useful when using reload warps as you often end up facing the wrong direction, and at other points in the route as well just to optimise your path on the next screen. Hard to get right and you often end up immediately going back to the screen you just left if you get it wrong. I'm sure anyone who played the game a lot noticed this effect at some point, using it intentionally is another matter! - Intentionally running into walls. I managed to use this on the first screen when picking up the lab coat, if I run straight into the wall and turn around during the hurt animation I seem to get out from behind the screen much faster than stopping and turning. Trying to find more places where this could be exploited. - Principle Island fort. After getting the saber, suicide on the rabbibunny, you respawn outside the fort and it's faster than escaping normally. - Well of Sendell. You only actually need to kill one of the three guards at the base before you climb to meet Funfrock. There's a pickaxe guy that appears from round a corner, he gets stuck on the scenery for a while if you run past fast enough. The guy on the left-hand platform can't hit you if you get the climb right. So just run past them to the guy on the right-hand platform and kill him with Discreet mode, then you can climb in safety. * Island hopping. You can get onto land quicker by jumping corner to corner near the gun turret. It doesn't look like you can make it as it's a tight jump and the gun turret is covering the spot, but it's surprisingly easy with the right timing, and the gun shoots over your head when you land. * Final room levers. Found a whole new strategy, instead of pressing two levers to make the platforms into stairs, just jump straight onto the first platform and throw the magic ball at the third lever, then you are only two jump away from the top. Much faster but probably needs to be seen to make sense. * Leaving via the boat. Just walk backwards onto the boat then you'll be facing the right way when you get to Principle. Hi serializer, I'm trying to beat the actual SS WR and the only thhing I've beat is my computer equipment, walls in my room, etc. Well I've started searching and saw your post with LOTS of crucial informations. Well I would like to know if you can look at my twitch stream and tell me where to improve as I'm french and limited in english some of the things you mention here isn't clear. I'm very interested in what you said and I state : Bu skip I found. Sure I can come and help you out on Twitch - what's your twitch channel, and when will you be streaming? I also still haven't quite beat the WR but I've been really close. Just haven't got around to running in a while, I really should start again. Some more updates because I kind of want to keep documenting things in this thread since a few people seem interested. Basically a bunch more stuff happened as the day went on. I ended up comparing notes with gravel and we both found ways to improve our runs ... and then some brand new strats came to light ... and then I discovered that the record was actually already better than we thought. One important thing that came to light in his video was that the mechapenguin doesn't actually need to be bought at the store. There's one hidden in an alcove in the White Leaf Desert, this is well placed for both the uses required in the run, so this saves a bit more time as well as 3 Kashes, makng the cash flow even simpler. Can detail this a bit more if needed but I have a really solid strat now for getting all the Kashes in a very optimal way. For anyone who is still following all of this, please come and watch my stream later on, around about 3PM 5PM GMT - am determined to get a good run, and am not planning on stopping until it happens Or all my fingers fall off. Last edited by serializer; 2015-08-29 at 13:50. Didn't see the stream, but its cool to read all the optimizations to try to shave precious seconds off. Thanks again for watching ... was pretty exciting to have a live audience! Final time was 1:18:37, that's 3 mins 23 secs faster that the prior single-segment record, and in fact even 37 seconds faster than the segmented record by Per Normann, I am totally pleased with this result but there is still plenty of room to improve. Having looked back over the video I'm now convinced that sub 1:10 is possible with what we already know. I went ahead today messing about with LBA, as well as LBArchitect/LBA Story Coder, with the intent to find a way to make the Lupin Burg part quicker; Success, I came up with a new strat. I call it the "Super Burg strat". I've been curious about finding a way past this since I was a kid and finally I found it! By my estimate this strat saves above or around 1 minute. The strat circumvents the entire sequence of "clobbering a clone", being trusted by the rebels, being escorted by said rebels (very slowly), robbing the till and finally getting the key to Upper Lupin Burg. By sneaking past a prominent Super Gro that is blocking the two passageways to Upper Lupin Burg, we'll be able to head straight for buying the gas and then up to the Astronomer. As for the sneaking part, I have no really experimented yet on how far you need to sneak or in what angles to not alert the Super Gro, so there's definitely room for improvement there. I've attached a picture below to illustrate the route. 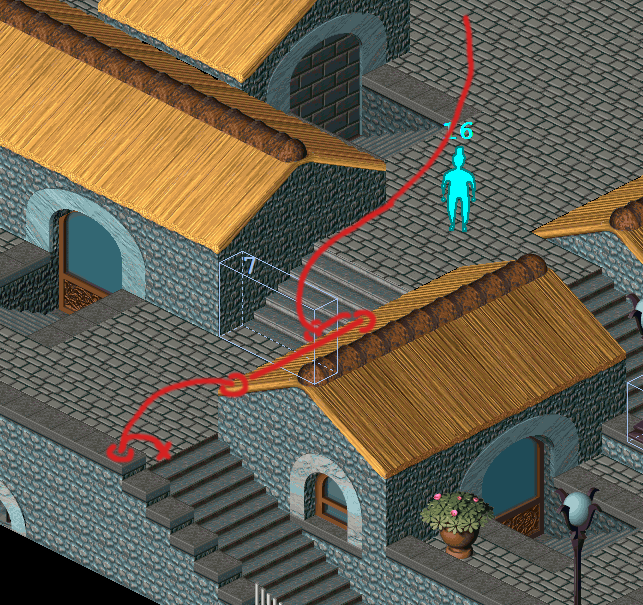 The most important aspect is that you drop around the 4th step (just about), in sneaking mode. The trigger is shown in the picture as well. It might require a slight change in the run however to allow for buying the gas without raiding the till in Lower Lupin Burg, as with this strat it removes the possibility of raiding it. I'm not sure if by measure of your WR run you would have had enough kashes to do so at this point. A shift to raiding the till at the Library would probably be the better course here and likely won't take much longer that it would to raid the till in Lupin Burg. The door is pretty close in the Library as well, so using a reload-skip should speed the raiding up there as well. Last edited by Homeless; 2015-08-30 at 21:18. What!!! Homeless you completely broke my route. Finally after doing much battle with Premier and Youtube, the video is online. Unfortunately it's in 360p right now but hopefully that's just Youtube dragging its feet. Everyone's been hard at work looking for new skips and strats. There's definitely been some new exciting development, especially with the tech that Crimson found which allows one to fall down behind certain cornered walls. This could proof very useful if we find situations where it can be used. As a strat for speedrunning it is however unlikely it will be useful. I timed it against serializers time and it was slower. Not to mention that once you go back through the hole it will still be closed, and the rabbibunnies are attacked by mutants still. It would be interesting to see how they react if the mutant facility is destroyed after using this little trick though.. Pipe trick!!! Well it takes about the same amount of time as talking to the bunnies normally to get to the front of the mutant factory. If the time could be improved then it might be faster by a *little* bit. However there is one really interesting thing about it - it means it's possible to cross from North to South without the bunny hole being opened. This would suddenly be super relevant *if* we found a way to pass through the gate from the South side into the mutant factory ... skipping the entire tank section. The main thing that concerned me about such a skip would have been that the bunny hole would never get opened and you'd be stuck in the North. So, this is still a very good thing to know. And also, thank you Darkflame! IMPORTANT : Ok guys we have to make a new topic now when there's something new like a strat or something. This post is getting complicated to read and figure out. My thought exactly! I've been spending quite a bit today trying to get through the gate from the South side into the mutant factory. The guard with the key spawns only if the mutant eggs have already been destroyed unfortunately. No other guard has a key either. There's also a condition on the door that it can only be opened by a key if the mutant eggs have been destroyed. So we have to find another way in. Either by glitching through the gate/fence or by jumping on the trees, I'm thinking at this point. There's a small tree which if we could get up on, we'd be home free I think. From there it should be possible to jump up on the big tree and then onto the fence and over. Tried to glitch up using a meca-penguin, but no luck. I'm out of ideas currently, but I'll keep looking. I was messing around with a mechapenguin, if you jump on top of it then press F2 before you fall off then it pushes you out of the way really quickly - was trying to see if this could push me through a fence but it didn't work.